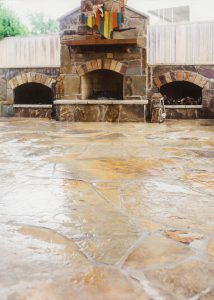 Bobcat Custom Outdoors’ process for Natural Flagstone Overlay not only increases the longevity of the process but increases its vibrancy as well. If you have been thinking about having a natural stone overlay installed on your homes porch, patio or driveway, contact us now to find out just how affordable our overlay technology is. If you are looking to add the beauty of natural flagstone, cobblestone, or another look to your patio, pool deck, walkway, entryway, or porch there are now great affordable options available. Bobcat Custom Outdoors can discuss these options with you and the different maintenance requirements for each. Contact our experienced sales engineers today for your estimate.